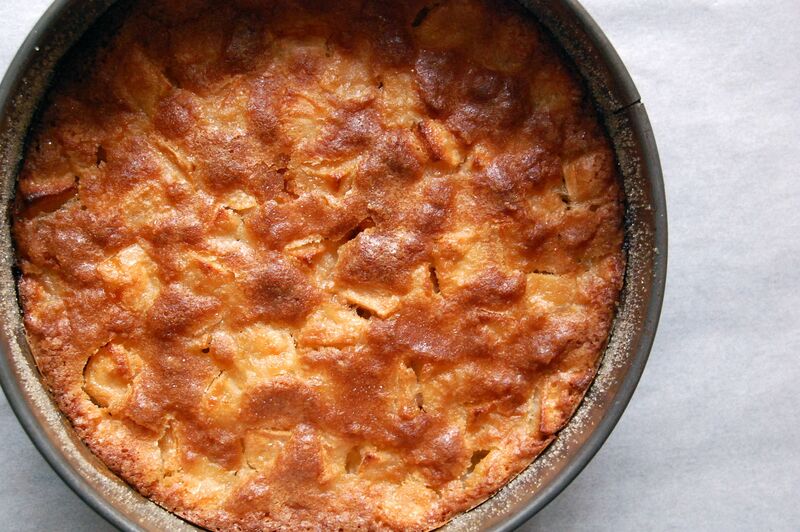 One more apple cake before spring | I made that! « What I wish I was eating. Bookmarked and waiting to make this on the weekend. YUM. I’m trying to imagine how it would do with a cream cheese frosting or some plain whipped cream. But I doubt it needs any additional adornment with all the apples in it. mmm mmm mmm …. this looks delish! This makes me particularly happy A. because I love custardy cakes B. because I live in Boston and can’t make it to Delancey. Though, I’m not quite sure it is safe to have it around my apartment either … regardless, thank you for sharing this! I am not a big fan of cake, but I like apples and custard: I’ll be trying this when apple season arrives in August — with the caramel and without the salt. Thanks. I was sad to see that dessert go! My advice is to not skip the salt, it doesn’t take much and it makes the dessert. This looks AMAZING and I might be making it tonight. Hi Lauren, RT meant “room temperature”. It was a quick post and I didn’t slow down to change it to civilian speak! Read this recipe and made it for dinner with a friend. Delish! I added just a bit of fresh ground nutmeg, ground cloves and cardamon to the custard; also baked it in a 9″ cake pan that I liberally buttered and sprinkled with raw sugar. No problem with serving once it was room temperature. Thanks for a great recipe. This sounds great! Which Dori Greenspan cookbook is it from? This looks incredibly good. I’ve never had a cake like this one but I’m sure it will be wonderful. 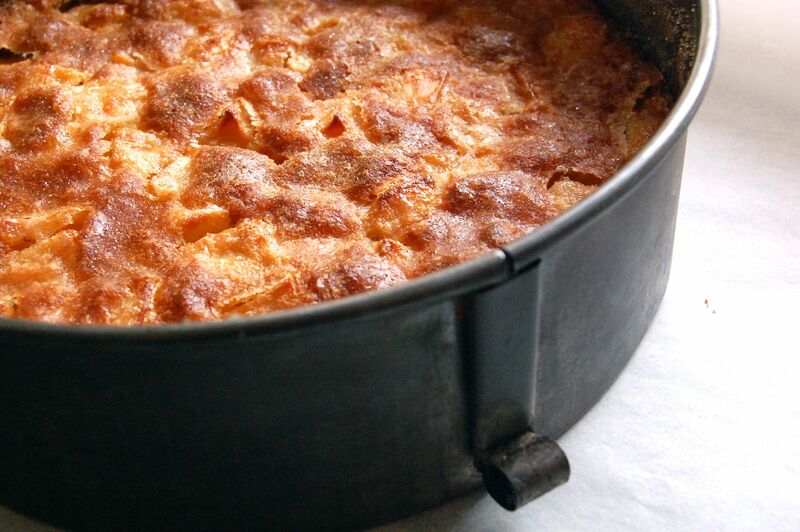 I often make apple cake, but never thought of eating it with maldon sea salt and caramel! wow, sounds bloody lovely!! YUMMY! Man, does that look good. I love your site. I have to ask, although I suspect that I’m just overlooking the obvious, do you have a “Recipes” listing? I’m new to your site and want to just have a look at everything available, at a glance? Thanks for info! Hi Elizabeth, unfortunately I don’t, because I haven’t figured out how to add it :). One day! Okay, thanks. I’ll just peek through as I have time, and continue from this point forward! I haven’t the foggiest idea how to do such a thing either, but the other food blogs all (or mostly all) do it, so it’s possible ~ no doubt really time consuming though. Anyway, I’ll be watching daily. Thanks again. I haven’t seen rhubarb anywhere yet, and I have apples at home. This makes me exceedingly happy! Dessert tonight, yay! Update: I just ate a piece of it warm. Simply amazing. I’m going back for seconds. Thank you, Brandi!! I’ll be making this for my boyfriends mother’s birthday this weekend – looks SSOOOOOO GOOD! I’m never disappointed by an apple cake. This looks scrumptious and it reminds me of the gooey, caramelized baked apple pancakes I used to make my kids when they were young. I am going to try this AFTER swim season!! I’m new to your blog. What a great job you do! I made your apple cake for a birthday at work today and it was a huge success. And, such an easy cake no sifting, or separating of eggs. A really easy process with a great result. I didn’t have the salt you recommended but I did have some very nice French finishing salt and it was terrific. It does make the dessert. I gives the final cake a nice sophistication without being at all fussy. Like another poster I used sugar in the raw to coat my spring form pan and on top. It worked great and gave a nice carmel-ly appearance to the cake. I have another cake in the oven right now. I’m baking this one for Mother’s Day dinner. What could I do? I have more carmel sauce! Looks amazing thank you, and thank you from a UK reader for weighing in ounces; much easier for my brain. This is getting cooked tonight, with some sad apples lazing in the fridge – they don’t know how lucky they are! OMG! That cake looks brilliant! I’m going to try it in the next two weeks! Thanx for the idea! I’m not sure if this is a dumb question but, what kind of apples should i use for this recipe? what happened to you? I love your recipes. I like the custard idea!, looks like it would be very moist, yum! btw, I thought we might trade recipes! 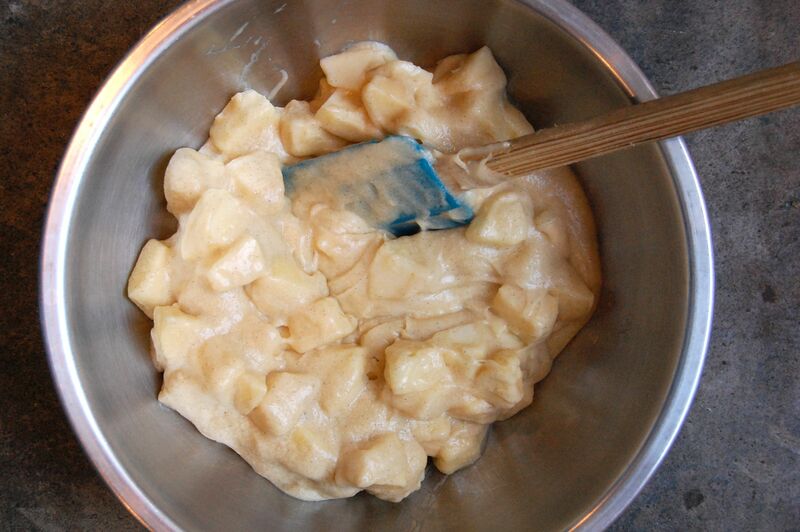 This is for an apple tart that is so delicious! Come back and post more! I miss reading your great site. I was just reading Dorie’s version of this. Why the decision to use apple cider instead of rum? Does it pump up the apple flavor? Love your blog, Brandi. I just made this last night and MAN was it easy! It smelled awesome. We are eating it today at work at 1 p.m……it’s going to be a long morning.